Struggle with Teeth Grinding? Your Dentist Can Help! Have you been feeling a little more stressed lately? Are work and family constantly giving you new things to worry about? While you might think that you’re putting on a good face for the world, there is one thing that may definitely be showing your stress: your smile. According to the American Sleep Association, as much as 10% of the population suffers from bruxism, which is a condition where a person unconsciously clenches their jaw and grinds their teeth. It can be brought on by a litany of factors, but the most common one, by far, is stress. Over time, this can cause severe damage to the teeth, even causing them to break and fracture. How can you know if this is affecting you? What causes this condition? More importantly, what can you do to stop it? Fortunately, Dr. Masha Kogan, can answer all of these questions and more. As we just mentioned, stress is by far the leading cause of bruxism, as it is found to be a factor in nearly 70% of all cases according to The Bruxism Association. This isn’t too strange as stress has been shown to cause muscle tension throughout the body for years. In bruxism’s case, this tension occurs in the jaw, which can lead to a wide range of problems including muscle pain and broken teeth. Bruxism also seems to coincide with certain lifestyle factors. Those who regularly consume alcohol, tobacco, or take medication for anxiety, sleep, or depression have been shown to have higher rates of bruxism than the normal population. The last potential cause is sleep disorders, and more specifically, obstructive sleep apnea. People suffering from sleep apnea temporarily stop breathing for short periods throughout the night, and this can cause tremendous amounts of stress and extra movement, including (you guessed it) teeth grinding. What Can You Do About Teeth Grinding? So you’re pretty sure that you’re grinding your teeth at night, so what should you do next? It’s an unconscious habit, so you can’t simply just stop it. 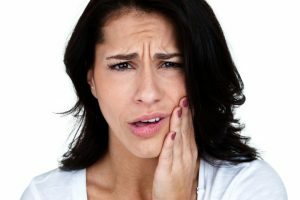 Fortunately, the solution to this potentially terrible problem is relatively straightforward, and you can find it with your dentist. To help patients dealing with bruxism, the Dental Center of Westport provides a small, custom-made mouthpiece called a nightguard. A patient only needs to wear it when they go to bed, and it works by placing a protective barrier between the teeth, preventing them from being damaged by grinding. Because every nightguard we make is unique for each patient, it is not only effective, but comfortable as well. After just a few nights of use, most patients don’t even realize that they are wearing it. What they do notice, however, is how most of their bruxism symptoms start to quickly melt away. If you’re experiencing any of the bruxism symptoms we listed above, please don’t wait to get treatment. This condition can severely weaken the teeth, and this can eventually damage them so much that they need to be extracted. The Dental Center of Westport can help, and before you know it, you can have the peace of mind that your smile is safe while you sleep. To learn more about bruxism and how we can help you with it, please contact our office today. Comments Off on Struggle with Teeth Grinding? Your Dentist Can Help!